I am from Palmview, TX and a Palmview High graduate from the Class of 2010. I did my undergrad degree in Kinesiology with an emphasis in Athletic Training at the University of Texas Rio Grande Valley, I am a Vaquero but I also consider myself a Bronc since I was part of the transition from UTPA to UTRGV. Not only am I a Licensed Athletic Trainer but am also a Licensed Massage Therapist and American Red Cross First Aid/AED/CPR instructor. I currently reside and work in Palmview at my Alma Mater. I try to stay involved in my profession and most importantly in my community. Currently I am the webmaster for our Valley Athletic Trainers’ Association website,and volunteer for Gridiron Heroes committee. I am in year 2 as an Athletic Trainer. Those close to me know my story, I became intrigued by Athletic Training my senior year of High School, thanks to Melissa Reinert and Scott Chambers. As an athlete I had 2 “major” injures that landed me in the athletic training room. One was dropping my max weight onto my thigh while doing power clean and second was having a subconjunctival hemorrhage on my right eye by getting my eye jabbed and receiving a concussion all on the same play. But Doc Mel and Doc Chambers were there to have me back on the field. After all that I only missed one game my senior year. BUT I went on to dance flamenco my freshman year in college with a professional dance company, Yjastros, in Albuquerque, NM while attending Central New Mexico CC and taking a couple of courses at the University of New Mexico. After that one year in Albuquerque my grandfather passed away and it was time for me to come home. With uncertainty of what I wanted to become I enrolled at STVT where I received my professional massage therapy license. 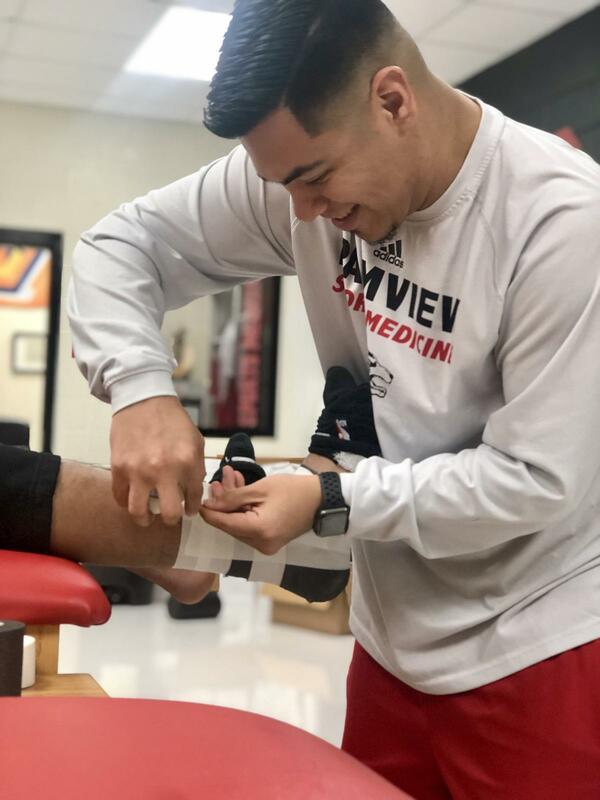 Halfway through the program I knew I loved healing people and also loved being around sports so after graduating STVT I enrolled at UTPA/UTRGV to pursue my Athletic Training degree and went on to become the 2016 Student Athletic Trainer of the Year while working with baseball and volleyball. My kids do. Every single student athlete and student athletic trainer has a unique story to tell and I try to always be there to listen as my teachers and mentors did to me when I was their age. It’s a great feeling not only rehabbing them back to health but also teaching them how to avoid such injuries by taking care of their body so they can fend for themselves when they get to the next level and the real world. Athletic Training has given me many opportunities to travel. With UTRGV I got to travel with baseball to Abilene. Had the honor of working with the 2017 WAC Volleyball Champions and received the PFATS Minority Scholarship which granted me an intern position with the NFL Tennessee Titans which I got to work the two home games vs. Carolina Panthers and San Diego Chargers in Nashville, TN and travel to Oakland, CA vs. the Oakland Raiders, as well as to Miami, FL vs. the Miami Dolphins. In my first year at Palmview I got to Travel to Corpus Christi for XC Regionals, San Antonio for Track and Field Regionals and Austin for State Track and Field where I got to see the most decorated female athlete Palmview has ever had. Year 2, I was selected as a TGCA All Star Athletic Trainer for Softball got to travel to Arlington, TX and this football season I got to Travel to Corpus Christi for my first ever football playoff game. Currently I am helping out the Rio Grande Valley Dorados and will be able to travel to Mexico City, MX and Austin, TX in their first season back! Be AMBITIOUS , Be OPEN MINDED and NETWORK! You never know when the other person is in a position to help you or you’re in a position to help them. For current ATs, balance your work and family because self time burn out is real! You have to be able to manage your time. Lastly, being an Athletic Trainer is the most selfless job. We give and give and don’t take back BUT when recognized it makes it all worth the while.